According to a new market report published by Transparency Market Research titled “Biomedical Refrigerators and Freezers Market - Global Industry Analysis, Size, Share, Growth, Trends, and Forecast, 2016–2026,” the global biomedical refrigerator and freezer market is expected to reach a value of US$ 4,712.7 Mn by 2026. In terms of value, the market is estimated to expand at a CAGR of 4.5% during the forecast period from 2018 to 2026.The Asia Pacific biomedical refrigerator and freezer market is projected to have the highest growth during the forecast period. The market witnessed considerable growth due to increased demand for research and clinical trials activities. 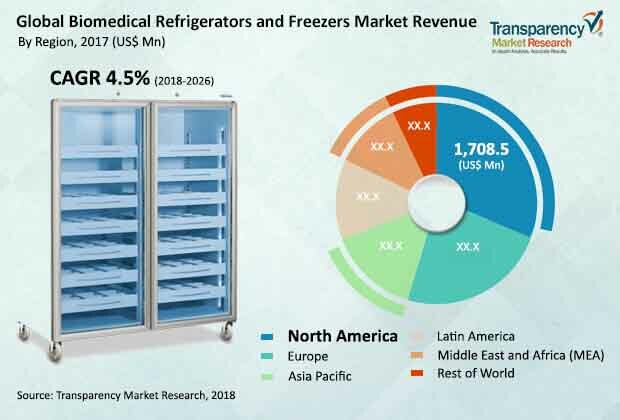 The biomedical refrigerator and freezer market is influenced by market dynamics with the prime driving factor being the increase in demand for biopharmaceuticals and organ transplant. Rise in demand for organ transplant due to an increase in the incidence of organ failure boosts demand for biomedical refrigerators and freezers globally. On the other hand, one of the main challenging factors affecting this industry is the high cost of the equipment and longer life span of the devices. Longer life span of devices reduces the purchasing frequency by end users. The biomedical refrigerator and freezer market is expected to provide opportunity to players who are manufacturing green technology based biomedical refrigerators and freezers. In 2017, based on product type, plasma freezers accounted for market value of around US$ 896.4 Mn in the global biomedical refrigerator and freezer market. This is because of increasing number of apheresis procedures performed, coupled with rising demand for the storage of fresh frozen plasma (FFP). Additionally, increasing number of hospitals, research laboratories, and pharmacies have resulted in enhanced adoption of biomedical refrigerators and freezers. These factors are expected to drive the growth potential of biomedical refrigerators and freezers. In terms of end user, the research laboratories segment is anticipated to expand at a CAGR of about 5.1% in terms of value. By geography, North America region is expected to continue its dominant share in the biomedical refrigerator and freezer market with more than 51.29% share. Across the North America region, the U.S held more than 86.35% share in 2017 in the biomedical refrigerator and freezer market. The top companies considered while studying this report of the global biomedical refrigerator and freezer market are Aegis Scientific, Inc., Eppendorf AG, Haier Biomedical, Liebherr Group, Panasonic Healthcare Co., Thermo Fisher Scientific, Inc., Terumo Corporation, Philipp Kirsch GmbH, and Helmer Scientific.